Posted on January 19, 2017 at 9:49 am. Construction of the new casino in Brisbane’s Queens Wharf is scheduled to begin in March this year, and painstaking measures are being put in place to ensure that none of the old heritage listed buildings in the area are impacted by the new development. The Queens Wharf is one of Brisbane’s most treasured historic sites, homing some of the most culturally significant heritage listed buildings in the country. It’s where European settlement began in Queensland more than 200 years ago, and before that it was home to Indigenous Australians for thousands of years. While many of the buildings have been empty and neglected for decades, the casino development project aims to carefully restore the buildings around Queens Wharf to repurpose them as retail space. 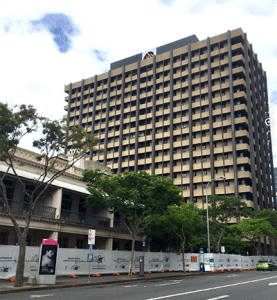 Brisbane only has a small number of heritage listed buildings, so the casino developers are under the watchful eye of officials and the public to make sure construction goes down without a hitch. The biggest concern is that demolition of the surrounding government buildings will cause damage to the foundations of the heritage listed buildings on George Street, with footings being scrupulously inspected to make sure the foundations are strong enough to survive. Project director of the Destination Brisbane Consortium, Simon Cooks, said that all necessary measures will be taken to ensure survival of the heritage listed buildings, including foundations being reinforced, existing cracks being watched and vibrations being monitored. Braces and scaffolding will be installed to protect the buildings, essentially providing a “straight jacket” around the structures. Archaeologists have also been inspecting the footings of the heritage listed buildings to make sure that nothing of historical significance will be destroyed during the redevelopment. Several glass bottles dating back to the 1800’s have already been discovered. The redevelopment area is on state owned land, spanning between the Brisbane River, George Street, Queen Street and Alice Street. The space contains a mixture of heritage listed buildings, under-utilised government buildings and neglected riverfront land. The Destination Brisbane Consortium project aims to repurpose the space and transform the riverfront into a world-class integrated resort. The project is expected to cost upwards of $3 billion, covering more than 26 hectares across land and water. Completion is expected for 2020. Unsurprisingly, the Queens Wharf casino project has attracted criticism from many who are concerned about whether an integrated resort is the best way to repurpose this neglected riverfront space. The Australian Institute of Architects is amongst the concerned, questioning the scale of the development, the lack of public access to the area and the amount of public consultation involved. However, the president of the Queensland branch said that while it’s important that heritage buildings are paid their due respect, it’s also important that old buildings are given modern purpose, which we think is a valid point. Many of these buildings are deteriorating due to neglect, so it’s better the casino project with its billions of dollars of funding helps revive them before they fall apart completely. Whether or not you agree with the construction of a second Brisbane casino comes down to personal choice, but it’s difficult to argue with the benefits that the Queensland Government’s Department of State Development has listed, including a projected $1.69 billion increase in annual tourism to Brisbane, the creation of 150 new jobs and a guarantee of $880 million in casino taxes for the first 10 years of operations. To stay up to date with the Queens Wharf Brisbane project timeline, visit queenswharfbrisbane.com.au and bookmark our website for future updates.